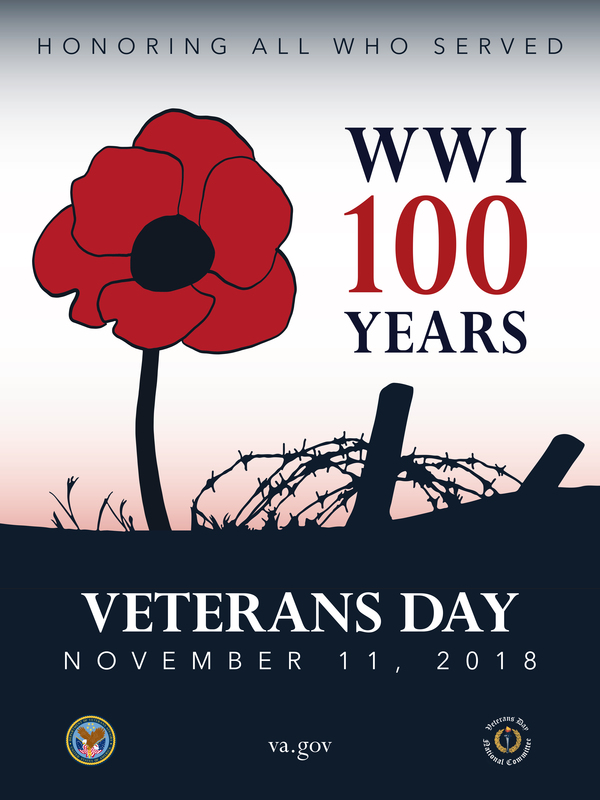 Veterans Day: Every year, for the last 99 years, Americans have gathered to honor and remember all the men and women who served this great nation; first in WW1 and subsequently in all wars. November 11, 2018 is the 100th year anniversary of Veterans Day, and it is a day that should give us all pause. Why? Because it is a day that reminds us to remember that wars decimate families, destroy communities, and leave us forever heartbroken for those we lost. On this day, we are forced to face the painful reality of war and the frailty of human life. We celebrate our lost and surviving Veterans and their families and, by doing so, we get to celebrate our own lost ones with our families/loved ones. As far back as I can remember, I’ve paused to honor all the men and women in countries around the world who, like my Dad, served their nations in some military capacity. It takes great courage and a deeply patriotic heart to offer yourself as a sacrificial lamb so loved ones can live in peace and enjoy their freedom. While freedom might be our inalienable right, it is not easily attained. Many have fought and died for it. For that reason, I duff my cap daily to Veterans everywhere. For those of us who have lived in war-zones and/or survived any kind of war, we know the value of our freedom, and the great gift of raising our children in a free country where the vagaries of war are not part of their memory bank. I am a survivor of a civil war, and I know it is an experience I would never wish on anyone. Wars destroy everything in their path. They destroy the lives and innocence of children. They destroy the very foundation of family life leaving mayhem and maimed souls behind. Many men and women who return from war zones come back deeply disturbed by their experiences, and the nightmares haunt them for the rest of their lives. How do we honor those courageous souls who served us by sacrificing their sanity and peace of mind? How do we honor their pain and suffering and their distraught loved ones? We honor them by thanking a Vet, by helping a Vet, and by teaching our children that war is not the stuff of video games. It is not entertainment. War is real and it leaves permanent scars on everyone it touches. We must raise our children to seek alternatives to war. Why must we seek alternatives to war? Many survivors of war, both adults and children, suffer from PTSD. The horrors are embedded in their psyche and give survivors nightmares for the rest of their lives. The nightmares haunt both winners and losers in wars, and that is why we need to work together as a global family to minimize incidents of war around the world. It is imperative that we do our part because if we don’t temper the hate and the rage that begins in our homes, and spreads out to become warring factions, we will continue to perpetuate opportunities for war. When we open the door to strife and conflict, our dedicated servicemen and women rise to make the ultimate sacrifice to defend us all. Our careless, thoughtless acts of wickedness against our neighbors and each other, plant the seeds that germinate, over years, into ego battles and eventually into wars. These wars leave so many innocent children and families caught in the crossfire. The work must begin in our hearts and homes. Who do we need to HONOR? As I considered this special day, it became quite clear that we face daily battles in different configurations. In times of strife, families, friends, and servicemen/women, step up to serve and protect their loved ones. Their acts of courage benefit us all, and my gratitude goes out to all who have served others globally and in every line of work. I think of our teachers, our caregivers, our good leaders, our military personnel, our firemen/policemen, our doctors/nurses/first responders, our servers/helpers in every field. From our parents to our policemen/women, we have so many folks deserving of honor. Some have served without recognition or glory, while others have served with bravery and public acknowledgement. The truth is that they have all served mightily because they put service above selfishness. How have you honored them? How have you served your fellowmen/women? How do we honor those we love? We honor our servicemen/women and all who make our lives comfortable and safe by saying THANK YOU at every opportunity we get. We honor them by being grateful, by offering our help to others in need, by remembering them in our daily reflections, and by showing our gratitude through verbal expressions and acts of selfless love. Why wait for some one to pass on before declaring your gratitude for their role in shaping who you have become? Don’t take our Vets or loved ones for granted. They have played enormous roles in our lives and it behooves us to show our gratitude. Serve others and always say thank you. People forget that no one owes another anything on this planet. We do good because it feels good and we see others progress from the help. Do good for its own sake not for some reward. Honor those who have served our nation. Honor your parents and your loved ones. To serve/help others without ulterior motive is the highest honor. Positive Motivation Tip: Honor those who have served our nation. Honor your parents and your loved ones. To serve others without ulterior motive is the highest honor. Veteran’s Day really is and should be a day of introspection. We should always remember the men, woman and animals who died so that we could all live free–and to remember to help those who lived but came back shattered–their lives never to be the same. Moni, your thinking lacks compassion. It is neither foolish nor wrong to mourn lives lost. A compassionate heart grieves for those lost and honors their memory with events such as this one. All the great traditions/teachings/masters have considered the pain and sadness loss brings to a family and none would call it by such terms. Have you never lost a dear family member? Your comment deserves reconsideration. I feel sad only US has such a day. It is so important to remember the horrors of war and appreciate the effort of military. in my country we have similar day but they bring on the wrong side. people celebrate the victory and glory of it, totally putting the horrors aside. Struggle incorporates everything that brings out the strength in you. It’s a painfully beautiful experience. What we need to see is what lies at the end of it. It’s usually worth it. 🤗💖 Thank you for making me reflect on this post. I agree that we honor people by doing good things and showing gratitude. I hope you had a thoughtful Veteran’s Day! Thank you to our vets. They mean the world to us. I was not aware of the other days that happen this week. World Diabetes Day hits home for me. If I had a theme for my life it would be this ‘Rather fail with honor than succeed by fraud. – Sophocles’. This is a very inspiring article and a reminder to be grateful for all those who have sacrificed their time, energy and lives. I feel as though honor is not as wide spread as it once was. And that the understanding of such is even less. I’m glad you posted a reminder to everyone. In England we have celebrated the Veterans day as well the other day. I was humbled passing by the Tower of London and seeing all the candles lit, by night, around it. It was such a special moment. I agree that nightmares haunt both winners and losers in wars and it will take everyone to hopefully eradicate war from our world. I truly appreciate all the sacrifices that were made, and are still being made by those involved in the fighting–all the veterans from all the wars in all the different countries. I honor them all with my total heart and soul. Such an inspiring post. We should honor those people who put their lives on the line in order to guard the freedom of others. My grandfather is an American veterans of World war II. One of the best way to honor them is to listen and understanding their standpoint. Whenever I see my grandfather, I see courage and an inspiring history. I always honor those people who serve their lives just for us to give freedom and a peaceful life. It’s not only in America where they honor the veterans. In Belgium this is also a kind of big deal. Especially because they fought for our country. You should check out You should check out Flanders Fields, there are many Americans buried there. It’s really sad if you see that we haven’t learn nothing yet after all those wars. The reality of war and the frailty of human life! That phrase captured the whole essence of war. Heroes gone, some living with PTSD (reminds of a series i have forgotten of a war vetaran captured in the middle east and became a muslim). We should honor the memories of those gone and still living. I believe they are heroes that should be cherished forever! I have never experienced war and i sincerely hope i do not! Your motivation mondays are always a great read and i would like to be part of it! I love to follow your blog. I just wanted to live a thought about the importance of Veterans day. I can’t forget those that died for us, for our peace and freedom and, we should learn from the mistakes of the past and never let us go the wrong way again. There’s nothing worse than war, we can never forget that. I love this kind of blog that inspire and motivate other. I also loved General Douglas MacArthur not just he is a good servant of the state but also help other nation to be free. Thank you for taking time to honor our veterans. War is never pretty but the men and women who fight for our freedoms deserve our honor and respect. Honor is so important, standing strong for a belief, putting everyone before your own self. I just want to Thank all the veterans for their amazing service, so my kids can grow up and be free. I will forever honor those who are courageous – which is really a majority of the population! I didn’t realize that its already the 100th anniversary and I would have to agree that this day definitely reminds us of the sad reality of missing these brave men. I just wish that there will be no more war. It breaks my heart to think of those who’ve lived during the time of war and had to experience it on a daily basis. My mother tells us of the times she had to hide her books so they didn’t know she was a student. Making sure that you honor yourself, your family and your country is so important. So many people definitely do not take the time out to do this. In England we had this whole remembrance thing on Sunday where some veterans read a poem. Really wonderful! What a thought provoking post, I have the upmost respect for everyone who have fought for their country in the quest for peace. I honour them all. This is a very timely post for veterans day. I have family who are in the military so this is very relevant to me. Thanks for posting. I don’t really agree with war as a general rule but I think honoring our veterans and those who lost their lives is so important. Many of my family members have served in the military and it truly is a selfless act! I love Motivation Mondays and actually motivation everyday. Great post, thank you for sharing. I definitely need it to read it. I love your Monday motivation posts, they’re really great! The saying by Samuel Smiles is perfect “The battle of life is, in most cases, fought uphill; and to win it without a struggle were perhaps to win it without honor. If there were no difficulties there would be no success; if there were nothing to struggle for, there would be nothing to be achieved.” I can’t agree more! Happy belated Veterans day. Thank you and wishing you the gifts of the season! I appreciate any person that serves our country and takes on the honorable opportunity to fight for our rights. This is the perfect Monday Motivation post for Veteran’s Day. And I think the part about honoring by being grateful is so important and underrated. My husband’s nephew served in the army with two tours to Afghanistan and one in Iraq. He is retired now and is living a quiet life with a cat and a rabbit. I am so proud to have known such a brave young man who selflessly faced a dangerous life to protect the freedom we enjoy today. Great post on Veterans Day and why we should honor our veterans! I love how positive your posts are! Thank you for sharing! I think many people take things for granted, and it is so important to honor those who have served. This is a good reminder of that! A few hours ago I heard “I’d rather die on my feet than live on my knees.” That came to my mind when I read the quote about “Rather fail with honor than succeed by fraud.” I think it’s so important because both make you think about the things surrounding your life. We should also honor the new heroes of the current generation. They also selflessly give their lives for others. Beautifully written post. It is beyond important that we honor those that we love and we cherish every moment that we have with them. I can totally relate to this post. Honor is so important. Happy Veterans Day to all the soldiers out there. We appreciate your service. The person that I am honoring are my parents who gives me lives and take care of from the time that was born until this time that I have a family. Such a meaningful post! Our veterans should receive all the accolade, care and support for their service. It breaks my heart to see some of them homeless or in dire straits. This is not what they deserve. We do take veterans for granted. Imagine how much love, devotion for a country and strength their have in their hearts.And how hard it must have been to leave their loved ones behind just so we can be safe today. Honor is something we honestly don’t do enough of. Thank you for inspiring me to honor more people in my life. Honor is such an important thing in life. It puts the proper perspective on things and it makes sure those who have lived with honor know they have been appreciated. I agree with you that we should try to avoid war if at all possible. It’s only a measure of last resort and not something to consider lightly. I’m always waiting for this blog to post new topic. I love this kind of blog that encourage us and give us a great wisdom that we can use in our lives. I think honouring those we love is so important, in all walks of life. I honour my sons memory every single day, carrying him with us and doing him proud. While I am grateful and indebted to those who have served, I am hopeful and dedicated to finding peaceful solutions to those problems that too often end in violence. This was a beautiful post. my father was in the navy so veteran’s day is important to our family! If there were no difficulties, there would be no success. I love the quote at the top by Samuel Smiles. Thank You for sharing. I am so thankful for those who did pay the ultimate sacrifice, and those who sacrificed time with family and friends to serve on my behalf. I know so many Veterans and the gift that they give us in freedom effects them and their families for a lifetime. I agree honoring the people who serve us is very important especially when freedom is at stake. Happy Veterans day!! They all heroes never forget! Love this! It’s important to honor those that protect our freedoms! I have never experienced war but I have a close relations who have done. If one escapes physical death during war, most of them have to live with the terror that event brought for the rest of their life. I think most times we really don’t give honour to whom it is due and I hope we realize that some day. Thanks for sharing, you got me in a reflective mode. So powerful how life is a struggle and it’s always going uphill. Always fight what’s worth it. I love and appreciate Al your wonderful motivations! Thank you! This is so beautiful and very inspiring post. I have a lot of people that I am honoring in everyday of my lives and one of them is my mother who took care me since the day that I was born until now that I have my own family. Wow, what a great tribute to our soldiers and those that live in war-torn areas! Thanks for the reminder to keep them in our thoughts every day. Great post. I absolutely agree. It’s so important to honour those who have served our nation. I am not acquainted with any veterans as we have not been involved in fighting wars since the 1980’s. However, I am grateful for my parents who gave us a very firm moral and emotional foundation and for their siblings who treated us like their own children for all of our lives. I pray that I have done enough during their lifetimes to let them know how much I honor and admire them. This is a good article to dedicate for this Veterans Day. It explains a lot about honor hence we learn from it. Such beautiful reflections that you’ve written here! What a great way to honor our veterans on veteran’s day! i believe that we are lucky that we do not live in the war zone, but we have a terrorist attack and I believe that everyone remembers it exactly like it was yesterday. Loved the quote and I totally agree to this. I do admire the sacrifice military do for us during the war. I do hope however it will never be need. War is horror and it is not supposed to happen in normal life. I love this. We all need some motivation to honor those who sacrifice for us all. I’m pretty sure I have commented on this post twice before!! Honor is an interesting concept and it seems you have hit on all the major points above. Honoring all our Veterans is one of the most important things we can do. They fought for our right to live in this country in freedom without fear. What a great motivational post. Honor is so important especially those in the military. Whenever I think of honor, I think of Mulan! I’ve seen a few homeless veterans on the streets and was quite disappointed! We need to be considerate about veterans and help their families as much as we can do. They have suffered a lot for our nation. I totally agree with you that we should teach our kids that war is not for the video games. It is real, brutal and impacts both the sides of the nation! It’s funny that we don’t forget to honor presidents amd heroes, but tend to overlook look those we should be honoring in our daily lives. I have been guilty of this far too often I’m afraid, but try my best to be aware of my actions! I like the concept of honor. I think of it as “my word.” Because people know they can trust me. I’m glad I haven’t lost that. We try to live with dignity and honor. Meanwhile, it’s not my current struggle honoring my parents. In order not to fight with them, I keep my distance. But I find it very hard to honor them at this point. I always think why many chose to engage to war… and I realized it was because war is a huge business – for arm dealers and manufacturers, etc. Because of greediness, many suffers. I think it’s important to honor those who have fought for our rights and served our country, even if we disagree with war. These men and women have put their lives on the line for us. Good reminder for Veterans Day. Nice to remember what all those have done for our country. It is both a blessing and a curse that many do not understand or value the meaning of war and Remembrance Day. On the one hand people who haven’t experienced anything at all to do with war are blessed and spared from the terrible things that go with it. On the other hand, they could be seen to be cursed as they take freedom for granted and don’t realise the real horrors that is war. As the saying goes ‘those who don’t appreciate history are doomed to repeat it’ – so we can only encourage everyone to be grateful and in full appreciation of what it took so we may live free today. Well said. Until we lose our freedom, so many of us take it for granted. It is a precious gift…like the gift of life itself. It is really important to honor the people who serve and give their lives to our country. I really love the concept of your article about honoring. Yes I agree ! We must be thankful to them, show our gratitude as sign of our honor towards them. We should always remember their good deeds and they indeed played a big part of our lives. I think honouring those we love is so important. It shows respect and love. This is such an interesting read! I like the concept of honor that shows respect and love. We should always give a little thought to the ones who fought/are fighting for their country. As we are now celebrating Veterans day, I am honoring those people who sacrifice their lives to give peace and freedom to our country. I always honor those people who give their lives for the peace and the freedom of the individual and of our country. And today, I also honor those people around me in loving me and respecting for who I am. I think it is so important to honor the military and the soldiers in our country. They sacrifice so much for us and work so hard, going months and sometimes years without seeing their families. Your post is beautiful, we should always honor those who serve but I would also love to see another route outside of war. Honor is so important. Happy Veterans Day to all the soldiers out there and quick shout out to all of them! I love your discussion of honor both in terms of personal struggles with difficulty, but in terms of the world around us, particularly veterans. It is a great reminder that no matter what we are facing, we need to be strong, face our problems with strong morals, and be open to the fact that these things (in every-day life) can shape us for the better. Also a great reminder of the sacrifice that others make so that we can be retrospective and seek to better ourselves every day. As usual, perfect start to the week! Thank you! I believe honor is something that is truly lacking in our society, especially for our elders. We could take a lesson out of the handbook from many Asian cultures, as honor and respect are highly regarded aspects of their daily lives. I’m doing my part however to instill honor for others, humans in general, into my children and to live in a way that exudes honor so that they can mimic my actions– not just my words. That poem is so powerful! Wow! Such a beautiful post to honor Veterans Day. This one hit me like a TON OF BRICKS!!! I’ve got to say, I think we’ve lost a lot of what honour used to mean, so it’s nice to see a post which talks about it. I agree that we should seek alternatives to war – I’ve met many veterans who suffer from PTSD from the time they served. It’s also so important to honor those who sacrificed so much for our freedom. So important to honor those men and women who have sacrificed so much so we can have freedom! And I absolutely agree, we can honor them by thanking them and never forgetting what they have done for us. It’s so important to remember and honor our veterans. I love the idea behind this post. It’s so important to be grateful to those who are fighting for our country. I loved the photos and quotes/poem you shared in this post too! I honor my dad. Even if fight over stuff, I am very thankful for what he did, serve in the US Air Force for 20 years. But, he was always there for the family and my mom during bad times. He is my hero. I love that quote ‘I’d rather fail with honour than succeed by fraud’. My husband is very much like this and sometimes it hurts him in business but I know he will be rewarded for being so honourable. Beautiful post. I think we must always be very grateful for those who defend us in any corner of the world. LOVE your daily motivations. There’s a book called Honors Reward that I’ve always loved – the principle of honoring people in your actions. I believe it’s a simple principle with so much power! In today’s world of uncertainty, it’s probably hard to find someone with real values. I so love Sir Willaim’s quote – “Life every man holds dear; but the dear man holds honor far more precious dear than life.” Back in the days when honor was to die for – each man stood valiantly down to their last breath. In Canada we honour those that serve and have served for our freedom on Remembrance Day February 11. The poppy and the poem Flanders Fields have become symbols we connect to service men and women with pride and honour. I truly believe we must always honor those who sacrificed for us. I didnt realize this was the 100th anniversary of Veterans Day. This is a great reminder that people have sacrificed a lot so that we can be free. Many thanks to all that serve or served. I was yesterday watching a war-related content in theater and couldn’t believe how cruel the time was. All of the people that lived in that time deserve honor. This post has given me an insight why we need to honor Veterans Day. The next time I see a Veteran, I should show my ultimate respect to these hero and heroin. We don’t have Veteran day here in Singapore so I have very little knowledge in this field. But during my studies in Australia, the Australian has the Anzac day in Apri. Old soldiers would come up to the street and parade. amazing detail on this…. thank you!! There are indeed people all around us who deserve honor. I learned years ago, to make it a habit to say thank you. To acknowledge those who have served and helped others. Our Vets deserve our respect, those in the battle field have sacrificed much. Honor is such an underdiscussed topic in today’s society! I love that you wrote a post on this important issue ! Honour is so important but is a value that is often ignored… and there are so many people who serve us in so many ways who should be honoured. That poem is so poignant – it’s awful that so many of those who have fought for us end up on the streets… with no honour at all.